Its official, the legislature wrapped up in the wee hours of Sunday morning on May 13. In all, it was a successful year for UFA in getting bills passed that we supported. There are many bills out there that we would like to see move forward, and we hope that many of them will be re-introduced next year. SB 37 – Boards of Pharmacy and Commercial Fishery Entry Commission – Includes amended language from HB 231 CFEC bill – Passed House and Senate and awaiting transmittal to the governor (UFA supported the initial bill and version D and was not able to meet as a board on the final version adopted into SB37). HJR 12 – Opposing FDA approval of GM Salmon and urging labeling (Tarr – passed House and Senate, awaiting transmittal to the Governor. HB 354 – Dive Fishery management (Ortiz – Senate Resources – UFA Supports), awaiting transmittal to the Governor. HB 76 – Mariculture Loans – (Ortiz – UFA supports) final version is SCS CSHB 76(FIN) … awaiting transmittal to Governor. HB 233 – Education tax credits – (Tuck) was amended earlier in the session to include the fisheries business and resource landing tax, and broadened the range of educational institutions. This bill did not directly pertain to the fishing industry as of UFA’s February meeting, but was amended to include tax credits in the fisheries business and fisheries resources landing taxes, and was expanded to a broader scope of educational institutions the credits apply to. Final version now awaiting transmittal to the Governor is SCS CSHB 233(FIN). 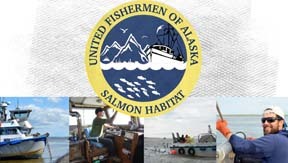 HB 231 – “An Act relating to the Alaska Commercial Fisheries Entry Commission; and providing for an effective date.” (Administration –House Rules – UFA Supports). See SB 37 above under bills passed. That’s all, folks. Wishing you a safe and prosperous salmon season. Bills related to fisheries, and others that may be of interest to fishermen…with primary sponsor and committee status as of the end of the regular session. HJR 19 – Arctic Marine Safety Agreements (Lincoln) – Passed House and Senate, now awaiting transmittal to the governor. Final version. HB 386 – Derelict vessels House companion (Seaton) – See SB 92 above under bills passed. SB 115 – “An Act relating to the Alaska Commercial Fisheries Entry Commission; and providing for an effective date.” (Administration – Senate State Affairs) See SB 37 above under bills passed.